4-H is open to boys and girls ages 5-18 regardless of religious, ethnic, economic and social background. 4-H can be found in rural and urban areas. It helps develop leadership skills and is a fun opportunity to learn new things and make friends. Most 4-H clubs meet once a month at a public location like a community center or at a church. 4-H clubs consist of one or more caring adults who lead the club, members who attend the meetings and help plan activities and can serve as officers in their club, and some clubs have groups of younger members (ages 5-7) called Cloverbuds. Cloverbuds is a unique program that builds confidence in kids, specifically designed for youngsters ages 5-7. Cloverbuds uses hands-on learning activities to help kids explore art, plants and animals, science, and the environment. Kids also engage in group activities that promote personal development, healthy lifestyles, and a sense of citizenship. As a Cloverbud, children will attend fun-filled meetings that include a learning activity, recreational period, and snack time. A trained volunteer leads the meetings with help from parents. Parents help with special events, refreshments, and transportation. 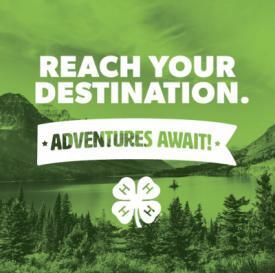 4-H members are ages 8-18. They can enter in and exhibit a variety of projects in the 4-H county show in the summer or during other planned exhibition opportunities. There are a variety of other fun activities available, including 4-H camp, conferences, and competitions. 4-H leaders are adult volunteers who lead clubs. They can be parents, grandparents, relatives, or people who simply enjoy working with youth. Like us on facebook for up-to-date information on news and upcoming events! Check out the virtual bulletin board for flyers and information about upcoming events!